Though not as tall as Mont Blanc, the Grandes Jorasses are a better-looking mountain. The Jorasses are a sharp east-west ridge, with the north face falling 4000 feet to the Mer de Glace, and the south face falling 8500 feet in only 2.5 miles to the town of Planpincieux in a chaotic mix of glaciers and ribs. 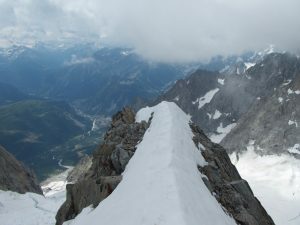 Real Men climb routes on the north face, including the late Ueli Steck’s famous sub-two-hour solo of the Colton-MacIntyre mixed route. My initial plan, perhaps a bit too bold, was to do the Grandes Jorasses at the end of the Roquefort-Jorasses traverse, a classic Alpine outing that normally involves trams, huts, and multiple days. Unfortunately, a combination of weather and Italy got in the way of that: one of the things I did to kill time on Monday was to talk to the guy in the guides’ office, who informed me that the trail to the Torino hut was closed, for reasons he could not explain in English. The tram, of course, was working perfectly, but I wasn’t about to spend 30 Euros for that, plus whatever it would cost to stay in the hut. Maybe I could have just blasted up the trail at night without seeing anyone, and I was really just looking for an excuse to scale back my plans. I settled for the standard route instead, which was still a fairly challenging big-boots day, but at only ten hours car-to-car, hardly epic. Still, the summit view was awesome, and the rock was solid and fun. I set out through town toward the hut at 4:30, which felt early enough given the previous night’s precipitation and what seemed to be partly-cloudy skies. The trailhead can be tricky to find, so I had fortunately scouted it the previous evening. Once out of town, I had no trouble following the path, even without the yellow dots, as it climbed increasingly steeply toward the refuge. 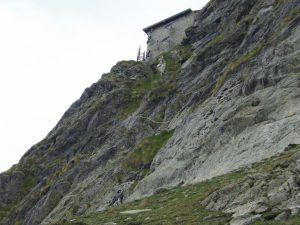 Along the way, it crosses a glacial stream on a metal bridge, then surmounts a cliff band via a ladder, before finally climbing the crag holding the hut with the help of some fat, bolted ropes. The hut was quiet as I passed, and I found no fresh boot-prints in the snow above. Apparently the forecast had discouraged people, and I would have the mountain to myself. 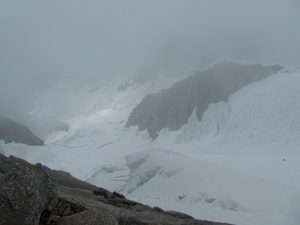 Fortunately there was an old boot-pack up the Planpincieux Glacier, because the face is confusing at best, and clouds were hanging over the upper mountain. I followed this path to the base of the Rocher de Reposoir, then scrambled up into the clouds. This rock ridge is fairly wide, with multiple paths possible, and various debris testifying to climbers’ frustration. Climbing into the clouds, I had some trouble picking the easiest route, but managed to find something no harder than low fifth class without much backtracking. While there is loose talus lying around, the underlying rock is solid, well-featured granite, making for fun scrambling. Eventually, I reached a point where the Rocher merges back into the upper Grandes Jorasses Glacier. 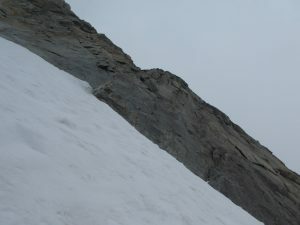 Here the route traverses a steep, debris-menaced arm of the glacier to reach the southwest ridge of Point Whymper, a sub-summit just west of the true one. There was a boot-pack in places, but this part of the glacier is more scoured, without enough surface snow in places for boots to leave a mark. The snow was actually a mess, with various surface stuff in different depths over a base of glacial ice. I was glad I had boots and front-points for this part, and an ice tool instead of a mountaineering axe. I followed bits of boot-pack through the fall zone, over a bridge across a bergschrund, then up some steep ice/névé to a steep gully leading up onto the ridge. Those 200 yards were the only time I used my crampons. The standard route ascends the ridge a short ways, then crosses onto the upper Jorasses Glacier and does… something. The old boot-pack had been filled in by the last night’s snow, and I was still in the clouds, so that seemed like a bad idea. An alternative route up the ridge to Point Whymper, staying on rock, seemed better given the conditions. I followed a line generally right of the ridge, which in retrospect was a bit harder than staying closer to the crest. It was a mix of class 3-5 terrain, mostly on good rock with lots of positive edges; while I have not done both, I would recommend this route over the standard glacier/snow plod, at least on the way up. Along the way, I passed a big yellow-and-black sign, and several solar panels with no obvious purpose. 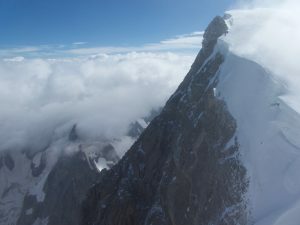 I had resigned myself to a cloudy summit like the Barre des Écrins, but 20 meters from the top, the clouds began to thin, and I summited to amazing views of the rest of the high Mont Blanc massif. 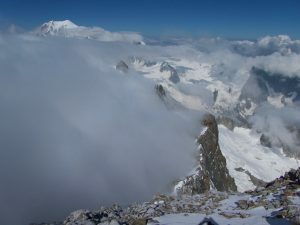 To one side, Mont Blanc stood above the clouds, while its aiguilles went in and out of view. To the other, the slightly higher Walker summit of the Jorasses streamed clouds from its south face, while much of the steep north face, including the Walker Spur, was cloud-free. I could see all the way down the north face to the Mer de Glace, and sometimes almost to Montenvers. Because it was rock instead of snow, I hung out on Pic Whymper for awhile before heading over to tag the summit. This looked easy, but was a bit more involved than expected, with a weird crevasse going right across the ridge. I kicked up the summit snow in just boots, then spent a few minutes checking out the surroundings, including the sheer Hirondelles Ridge descent to the east. I had hoped it would clear enough to descend the standard snow route, but it remained cloudy, and the previous day’s snow had mostly obliterated the boot-pack. Rather than worry about getting lost inside a ping-pong ball, I returned to Pic Whymper and retraced my route. It began to clear a bit as I neared the traverse to the Rocher de Reposoir, so I could finally see a bit more of the terrain I had climbed. 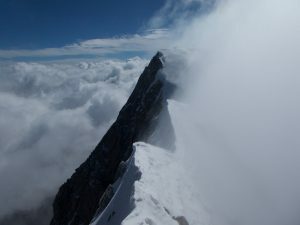 However, the upper mountain remained cloaked in cloud for the rest of the descent. I passed the hut, finding the guardian outside to be neither busy nor friendly, then clomped back to the trailhead. It was a short hike, but I was reminded why I prefer trail runners, and amazed that the man I met on Gran Paradiso had managed to descend so quickly in the exact same boots. Since it had only taken me 10 hours, I had enough time to take advantage of the good weather and do something the next day. Thinking about it, I remembered that the Matterhorn has an Italian trailhead that is both high, and not in Zermatt. I got some internet in the library, groceries in Morgex, then headed back through Aosta and on to the next. While groceries and gas in Italy are cheaper than France, Courmayeur seems less attractive than Chamonix, catering more to rich sight-seers than athletes. Walking through the pedestrian downtown, I saw sporting goods places, but also a jewelry shop and some realtors showcasing multi-million-euro homes. I can’t say I will miss the place. Hi Sean! Sounds like you’re having a grand old time~what ADVENTURE! It’s what I miss most when I’m back in NM from the Tetons and Yellowstone. Continue the fun~we so enjoy reading about your exploits. Take good care, will you? It has indeed been an amazing adventure — I haven’t felt this level of novelty in the mountains since my first visit to Canada in 2014. Hopefully the good weather will continue, and I can get in a lot more peaks.